It’s funny how you can look at a building a hundred times and decide every time that you don’t like it. Then one day you pass it by and the sky is bluer than you’ve ever seen it before and the roof tiles radiate a pure Tuscan orange and the stones gleam Jerusalem of Gold and suddenly beauty has displaced blight. It doesn’t happen often enough in our combustion-coated city centers, but when it does, what a joy it is to make photographs. I’ve walked past and admired the Zoharei Chama Synagogue on Jerusalem’s Jaffa Road on many occasions but often found it weary and unappealing. On this particular January morning—which followed a day of wind and rain—the sun shone through crisp, clear air and lit up the city. A hint of residual moisture added sheen to the road. Coming this summer: Teen Adventure Photography Camp. Details here. I framed the 100-year-old building, also known as the Mahane Yehuda Clock Tower, using a tree and light post, carefully positioning myself to allow their form to fall against the blue sky. As the light rail passed by, the sun bounced off the metal cars and shot across the wet pavement, adding an unpredictable and magical element that throws a little spice onto the image. 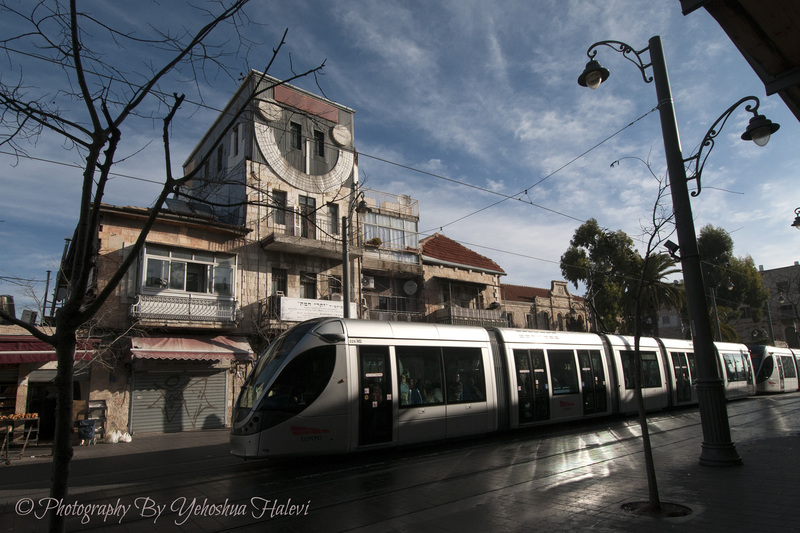 The juxtaposition of the modern railway with the historic structure elevates this photo to a powerful document of 21st-century Jerusalem. What a joy it is to make photographs. Sleep In. Open Your Eyes.